Captain Robert Alexander of the Royal Inniskilling Fusiliers died on 19th July 1943. The Irish Rugby and cricket international was fighting in Siciliy. Robert Alexander, known as Bob to friends and family was a Belfast man who rose through the ranks as a military officer and an international sportsman. Captain Robert Alexander (129996) served in 2nd Battalion Royal Inniskilling Fusiliers during World War Two. Born on 24th September 1910, he was the son of David Alexander and Minnie Alexander Belfast, Co. Antrim. While living in Belfast, Co. Antrim, Robert joined the Royal Ulster Constabulary in 1937 before enlisting in the Royal Inniskilling Fusiliers. He rose quickly through the ranks, becoming an officer by 1940 and a Captain by 1941. Before the outbreak of the Second World War, Alexander was a formidable rugby player. He toured with the 1938 Lions in South Africa, playing all 3 matches in the same team as the legendary Blair Mayne. 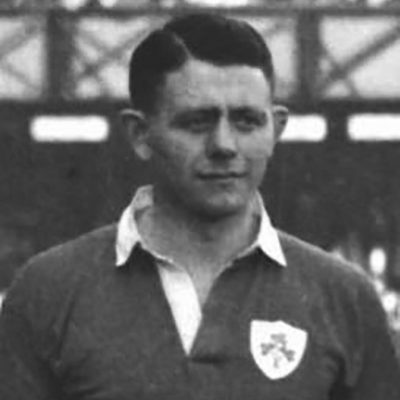 Bob won 11 international caps for Ireland between 1936-1939 and played for the Barbarians in 1935-1936. His only Irish try came against Scotland in 1937. He scored one try against South Africa in a Lions victory in Cape Town in 1938. Back Row: 1. Dr. H Emerson (President Irish Rugby Football Union), 2. MJ Daly (Harlequins), 3. L McMahon (Blackrock College), 4. JWS Irwin (North of Ireland Football Club), 5. J Megaw (Richmond and Instonians), 6. RB Mayne (Queens University), 7. AH Bailey (University College Dublin), 8. DB O’Loughlin (University College Cork). Middle Row: 1. P Crowe (Blackrock College), 2. E Ryan (Dolphin), 3. GJ Morgan (C) (Clontarf), 4. S Walker (Instonians), 5. CRA Graves (Wanderers), 6. R Alexander (North of Ireland Football Club). Front Row: 1. GE Cromey (Queens University), 2. VJ Lyttle (Belfast Collegians and Bedford). 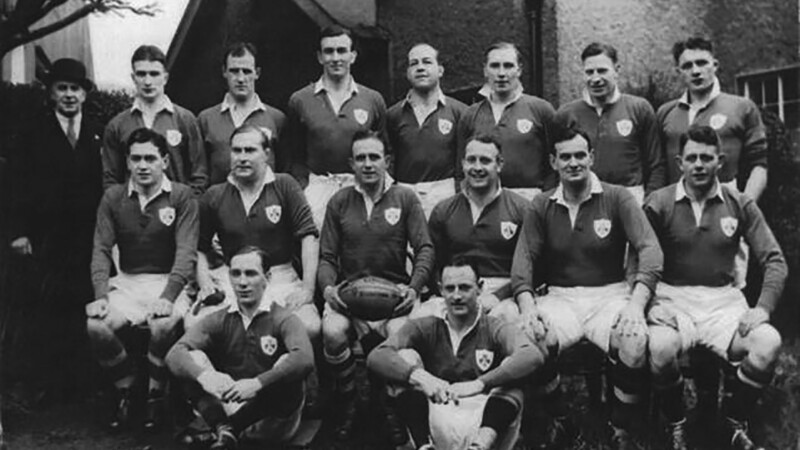 The Irish rugby team that played against England on 12th February 1938 featuring Belfast born Robert Alexander who served in the Royal Inniskilling Fusiliers. Photo from The Rugby History Society. Copyright unknown. Away from the international scene, he had played for Royal Belfast Academical Institution, Queen’s University, North of Ireland Football Club, and Police Union. His last rugby match was in 1942 when he captained the side in a friendly against a British Army team. As well as international rugby, Alexander also played cricket at international level for Ireland. He was a right-handed batsman and a right-arm fast-medium bowler. He played once for Ireland in a first-class match against Scotland on 18th June 1932. Bob passed me on the way. I wished him luck. He paused for a second and whispered to me with a smile, “it’s suicide”, and then went on. Bob died on 19th July 1943 leading an attack on the Simento River, Sicily. He was 32 years old. Robert Alexander’s grave is in Section III, Row F, Grave 1 of Catania War Cemetery, Sicily, Italy. If you enjoyed this post on "Robert Alexander", please share with your friends and followers.